There’s an old saying that the good referee is the one that you don’t notice but as I’ve said in this column before, that depends on the players. That’s not an excuse for a lower performance but a matter of fact. I was reminded of this when listening to Howard Webb’s review of EURO 2012 at which he and five other English officials were involved and I might add lasted longer than the England team. He compared this year’s final with that of the World Cup of 2010, where of course he issued fourteen yellow cards. It was an easier, better game to referee because the players were better behaved, In fact he considered that the whole tournament was played in a much better spirit and was a joy to referee. So what was the secret? He put it down to two things. One was UEFA’s preventive approach before the tournament began. National teams at their training grounds were visited by officials from UEFA, who showed to the players and managers what behaviour would be considered unacceptable and therefore lead to punishment. It was felt that the players responded to this. The other reason he credited for the better behaviour of the players was something that many, including myself, have been sceptical of, the two additional assistant referees, who patrol the goal lines at each end of the pitch. Although most believe this was initially a response to the series of goal line controversies, this is now denied. Sceptics would no doubt echo the famous Mandy Rice Davis phrase, ‘well they would say that, wouldn’t they’ after the England v Ukraine when the extra man on the line failed to see that the ball had crossed the line. 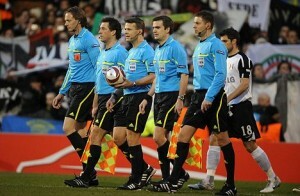 It is now claimed that their introduction was due to the increased illegal activities in the penalty area. I’m sure we have all become staggered at the amount of holding and shirt pulling whenever there is a corner or free kick into the penalty area. Referees are often criticised that they don’t take action against the perpetrators but a lot of this happens off the ball, when the referee’s attention is diverted elsewhere. There was some unpunished shirt pulling at EURO 2012 but the official view, which was supported by Howard Webb, was that there was a great reduction of foul play in the penalty area. This was because players realised there was a greater chance of getting caught. Also, we are told, the assistant referees welcomed the extra assistant, which meant they could concentrate on offside without having to worry about other infringements in the penalty area. Howard Webb was of the opinion that the extra pair of eyes in the penalty area enhanced the control of the matches. Incidentally, I have been asked several times how the additional assistants communicate with the referees as they don’t have flags to wave. You may have noticed that they have the bottom of a flag stick in their hand and this has a buzzer to attract the referee’s attention and of course they are on the referee’s radio circuit along with the assistant referees and fourth official. Until now, the use of two additional assistants has only been an experiment. Four football federations took part, Brazil, Qatar, Morocco and of course UEFA. At the special meeting of the International FA Board on 7th July, approval was given for their use. This doesn’t mean they will be compulsory, but they can be used by any competition in future. We will continue to see them in action at Champion’s and Euro Leagues matches, and Marcel Platini and has threatened to only use officials from countries where they are used, as he refuses to accept goal line technology. The Italian Series A League has introduced them already and the Premier League is said to be considering their use.